Today's featured Flagship Beer of February comes from one of the Philadelphia region's most recognized and celebrated breweries — Victory Brewing Company in Chester County. There's plenty more to Victory's current status as well as their history than I could fit on a one-page profile and in attempt to keep things as brief as possible here, much will fall by the wayside. During our walk-down-history conversation, Covaleski reminisced making HopDevil as loud and brash and different in the flavor and aroma as they did in the colorful marketing materials. It was something that the drinkers he described in the Philly area as being part of Coors Light's largest market in the country not being ready for. He was shooting for a bold beer sought out by a niche of beer drinkers that might have only been able to find it in a beer from Sierra Nevada, Sam Adams, or a handful of others at the time. "Bass with Balls"! Love it -- go read the feature profile for more of the background. Today, Victory sports a massive brewery in Parkesburg that dwarfs the original in Downingtown by 2-3 times, a smaller 7-barrel brewpub in Kennett Square, and a partnership with Xfinity Live! in the south Philadelphia sports complex. In 2016, Victory was brought under the umbrella of Artisanal Brewing Ventures along with Southern Tier Brewing in New York. The Charlotte-based company just announced late in 2018 a similar acquisition of Sixpoint Brewing from Brooklyn, NY. They have exciting plans for Sixpoint, according to Covaleski, which I'm not yet cleared to share. Thus far, it's been satisfying to see some of the old staples still being produced, such as Braumeister Pils, Storm King Stout, and Helios, in addition to the Flagships. My hope is that the ABV arrangement does as it's intended to do and that is preserve and grow its members to an even greater state than they did or could on their own. 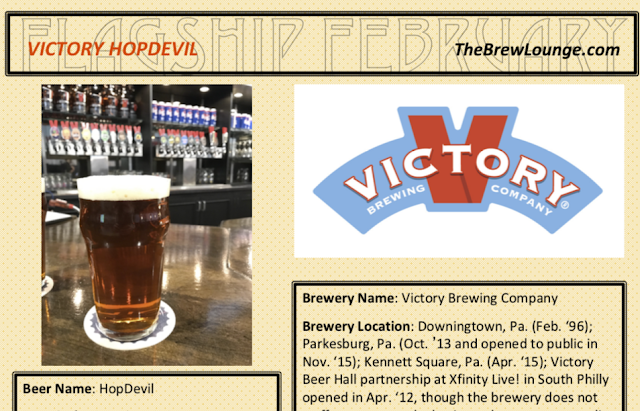 Now click the picture below for a full feature on Victory HopDevil. Disclosure: For this project, I solely created the list of 28 beers featured here on The Brew Lounge. I was in contact with each brewery and neither required nor requested complimentary samples. This beer was provided to me by the brewery while I sat and discussed Victory's history and beers with Bill Covaleski.